Fantastic start to an exciting new YA urban-fantasy series! Fifteen-year-old Bryn has, literally, been raised by wolves. At the age of four, her parents were murdered by a rogue ("rabid") werewolf, and Bryn barely avoided their fate when she was rescued by Callum, the powerful, ancient alpha in charge of the local werewolf pack. Callum placed Bryn under his particular protection and enfolded her into his pack, and he put her in the care of another human, a woman named Ali who is only 17 years older than Bryn. In addition to granting Ali great latitude in raising Bryn as her own daughter, Callum has permitted Bryn to engage in a highly unusual mental resistance to the engulfing tide of the pack's all-inclusive telepathic connection. He has also offered her a remarkable amount of freedom from his alpha ability to compel obedience on all the werewolves in his pack. The combination of uncommon freedom with an innately forceful personality has led Bryn to engage in a great many verbal and behavioral rebellions over the years, which Callum has responded to with remarkable patience and tolerance. But one of the things Callum has absolutely insisted on since earliest childhood that Bryn has always eagerly agreed to is a strict daily regimen of exercise and training in various warrior arts. Bryn runs up to 12 miles per day, climbs extremely tall trees, practices martial arts, trains with guns and knives, and engages in hand-to-hand combat with werewolves in their human form. After over a decade of close, affectionate supervision, Bryn would have sworn that she could trust Callum in every possible way, most especially that he would never lie to her, either directly or by omission, and he would certainly never allow harm of any kind to come to her. But all of those assumptions are blown away the day she discovers a teenage boy named Chase in a cage in Callum's basement. Chase has been turned into a werewolf by the savage, bloody attack of a rabid werewolf. He holds the secret to the elusive memories Bryn has of the rogue werewolf that destroyed Bryn's family, but Callum refuses to allow Bryn to pursue that crucial information--on threat of dire pack punishment if she disobeys. I absolutely love this book! I read a lot of urban fantasy, both for adults and teens, and the ones I like the most have great characters with loyal, protective, loving relationships which invariably are the force driving all the action. The protagonists of such stories get into lots of high-octane trouble because they are highly sympathetic, positive warriors who will risk everything, including their lives, to help the humans and nonhumans that they love. Bryn is a worthy addition to the best of urban fantasy in this regard. She starts out the book sounding as if she might just be an ordinary, rebellious teenager, but in fact she is rushing headlong across the length of the book toward becoming an amazing person. Someone with tremendous potential for caring for and loving others, both as a nurturer, protector and leader. I am a huge fan of Patricia Briggs's werewolf-based urban fantasies for adults, such as Book 1 in the Mercy Thompson series, Moon Called, and I'm also a big fan of the Twilight urban-fantasy series for young adults. For readers who like comparisons, I would say that this book--the start of what looks to be an extremely promising new series--is much closer to Briggs than Meyer in her approach to urban fantasy. Romance is the center of Twilight, but in RBW, the core of the story, as in the Mercy Thompson series with Briggs, is a very strong heroine discovering across the first book in the series who she is and the range and force of her unique gifts. I believe that all YA novels, no matter what type, are enriched by a strong band of friends surrounding the protagonist, but loyal allies are absolutely crucial for emotionally compelling urban fantasy. I'm delighted to report that this book has that component in spades. Bryn has a sixteen-year-old BFF, Devon, who is a purebred werewolf (a were born of two werewolves, an extremely rare event in this book's cosmology, since only one or two female werewolves are born every hundred years). Dev also happens to be a gorgeous, six-foot-four hunk with a quirky sense of humor who loves to sing and act in plays. Bryn is also very close to ready-for-anything, fifteen-year-old female werewolf, Lake, who adores guns. And most of all, she can count on Chase, the fifteen-year-old, made-by-bite werewolf. Bryn has an intense emotional and romantic connection with Chase that transcends time and space and is extremely moving. Fans of Edward and Bella, take note--this is a great romance! 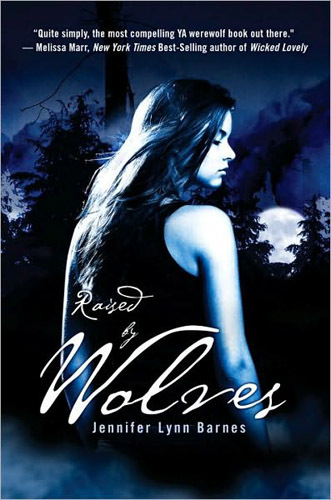 I also find it brilliant the way that the author manages to allow Bryn and her teen allies to accomplish amazing things in the climax of the story in spite of the over-protectiveness, and sometimes active hostile opposition, of dozens of adult werewolves. So many YA's create the necessary opening for independent, self-actualizing, dramatic action by the teen protagonists by having the adults in their lives be callously or selfishly neglectful. But the adults in this book are the dead opposite of that cliché. They are so totally involved with Bryn, they are practically smothering her with over-protectiveness. Finally, and very importantly, this book is extremely well written. The language in the book serves the story, rather than the other way around, and it doesn't scream a message, so it is definitely not lit fic. It is truly excellent popular fiction, meaning the heroine has a strong goal, takes dramatic action to get it, comes up against powerful resistance, and ultimately achieves a very satisfying, upbeat resolution. I cannot wait to read the next book in this series. The setup the author has created for future adventures is extremely original, compelling and heart-warming. I highly recommend this book not only for teens, but for any adult who loves urban fantasy. It can safely be read by kids as young as 12. Though some parents might find the violence PG, it is not particularly graphic, and the book is G-Rated as to sensuality and bad language.